At the Paris-end of Collins Street, this 5 star hotel is close to shopping outlets, art, business, and signature destinations including the Melbourne Cricket Ground (MCG), Melbourne Tennis Centre, Federation Square, the National Gallery of Victoria and Princess & Regent Theatres. The hotel’s luxurious rooms and suites begin from level 36 offering floor-to-ceiling views that stretch across the city skyline, bay and beyond. Each room is complemented by modern furnishings, high speed wireless or cable internet, executive desk and integrated ‘touch’ technology for ambient lighting modes and digital surround sound. As a Club Sofitel guest benefit from exclusive services including breakfast, all day refreshments and evening drinks and canapés in a lounge area featuring wireless internet, large plasma televisions, international newspapers and magazines and uninterrupted views. For meetings and events, the hotel offers a comprehensive integrated conference solution with 12 individual meeting spaces including the Grand Ballroom, a tiered 362-seat auditorium, exclusive 35th floor function rooms and comprehensive audio-visual services including car hoist access. Complement your stay with the contemporary dining of No35 – awarded a Chef’s Hat in ‘The Age Good Food Guide 2011’. Headed by Restaurant Chef, Stuart McVeigh, the restaurant offers contemporary artworks, breathtaking views and serves modern cuisine that highlight pure flavours that’s matched to wines hand selected by the restaurant’s Sommelier. Alternatively, enjoy the cosmopolitan cocktails in The Atrium Bar On 35 or sumptuous high teas and social occasions in Sofi’s Lounge on the first floor level. With a host of other services, discover the luxury of Sofitel. Address: 25 Collins Street, Melbourne, 3000. 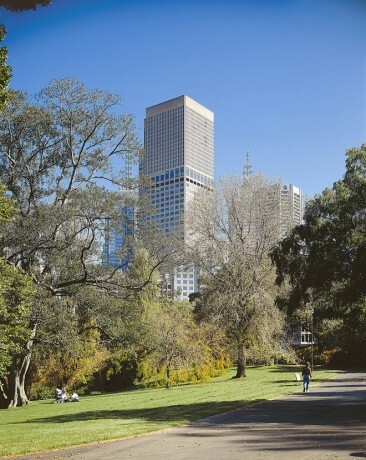 The Sofitel is pleased to offer Ci2012 delegates accommodation from $270 per night.